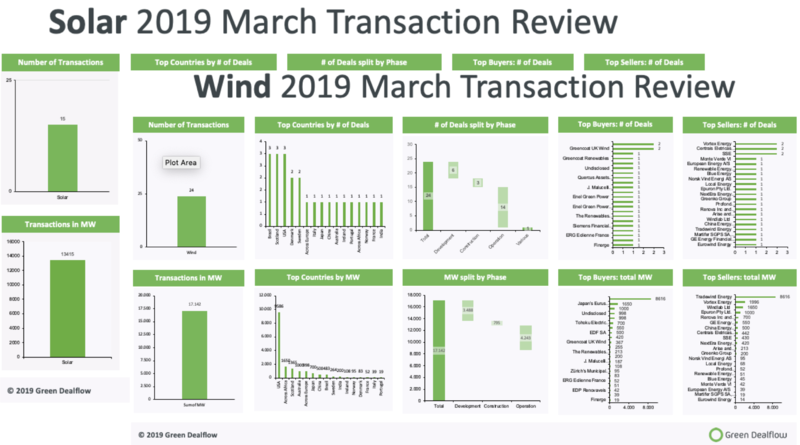 This week, Green Dealflow published its monthly transaction activity report of the solar and wind industries for March (access it here). The report is built from Green Dealflow’s transaction database that tracks equity transactions of solar and wind projects around the globe. Altogether the month of March has been a very busy month in both solar and wind deals with 39 transactions overall mounting to 30.557GW (gigawatts). In the solar industry, the report records 15 transactions amounting to more than 13.4GW in gross capacity transacted. As compared to a slow February with the same amount of transactions of 805MW (megawatts), March was significantly busier regarding MW transacted in solar energy deal flows. The USA were in the leading place regarding total MW transacted with 7 transactions amounting to more than 10.76GW. The USA’s leading position was mainly due to Enel Green Power North America acquiring Kansas-based renewable developer Tradewind Energy. Under the agreement, Enel purchased all of Tradewind’s development platform comprising of 13 GW of wind (39 wind farms), solar and storage projects located throughout the USA. However, Enel immediately sold the 6 GW solar and storage portion to Macquarie. Greece followed the US with one transaction of almost 2GW: SP Orange completed its previously announced second-stage acquisition of 100% of the equity interest of Heliohrisi S.A., which owns a variety of photovoltaic projects in Greece. The full capacity in comparison to the previous month went up by 1566,46%. As for the wind industry, the report records 24 transactions amounting to more than 17GW in gross capacity transacted. After the slow February with less than half of this month’s transactions amounting to 2.97GW, the trend changed in March for wind energy deal flows. The USA were again in the leading position regarding total MW transacted with 3 transaction of approximately 9.6GW, mainly due to Enel acquiring Tradewind’s portfolio. Africa was in the second place with 1 transaction of 1.65GW due to Japan’s Eurus Energy Holdings taking a 25% stake in the South African subsidiary of Aussie renewables developer Windlab Ltd. Eurus will assist in the development of Windlab’s 1.65GW portfolio of wind projects across Africa (Ethiopia, Kenya, Tanzania, Zambia, Uganda, Rwanda, Burundi, Malawi). Scotland took the third place regarding total MW transacted with 3 transactions of more than 1.36GW. The total capacity in comparison to the previous month went up by approximately 477%.